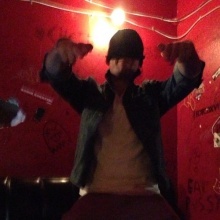 Fellow class member Colin Landforce and I are working together in reference to Portland hip-hop/R&B artist PropaneLv. Lv is a DIY artist with 18k Twitter followers, 7k FB Likes, 2 million YouTube views and a growing blog presence. 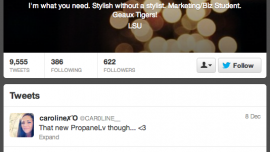 Modeled after a real PropaneLv fan, we created Caroline, a twenty year old student from Baton Rouge, LA. Her hobbies include fashion, music, and the LSU Tigers. She is active in social media, stays current up with mid-level hip-hop/indie/EDM blogs, considers herself a musical tastemaker among her peers and claims to have been "the first one to introduce ALL her friends to The Weeknd." Caroline is a PropaneLv fan.